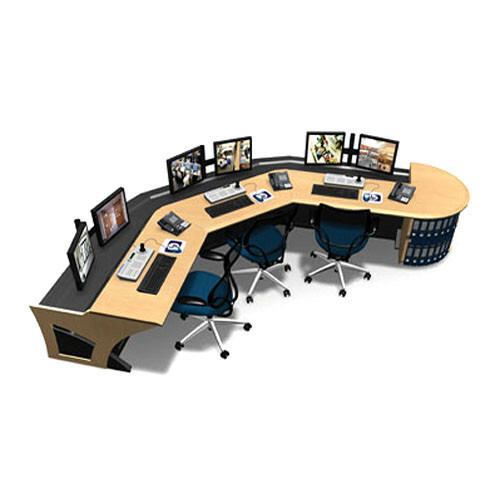 The Winsted Sight-Line Corner Console with Credenza features an elegant, contemporary design that is well suited for today's control room environment. The W5701 is designed to install in a corner of a room and with its 167.5" (14') width has ample space for three operators to work in comfort. Included with the console are the Radius Credenza and 3 dual mount LCD poles. These monitor poles are designed to attach to the console's integrated Versa-Trak system. Versa-Trak is a rail system that runs along the rear of a Sight-Line console and allows the repositioning of monitors by sliding the monitor mounts along the length of the track.